Bolivia’s constitutional capital is an elegant city of narrow streets and colonial architecture set deep in the country’s central-south. Its beauty, it being bolivia’s capital and Bolivian chocolate. For a small city, Sucre has a diverse dining offering. For snacking, explore the three levels of Sucre’s Mercado Central – with its cafe dedicated to Bolivian cuisine at the top, and jugo ladies on the ground floor making freshly pressed juices. Make a beeline for El Patio or Flores to try Sucre’s best salteñas; a type of Bolivian baked empanada, or savoury pastry, usually filled with meat and a sweet and spicy sauce. For main meals choose from humble home cooking at Pension Dona Petra and fine(r) diner La Taverne. Sucre is also good for vegetarian fare. 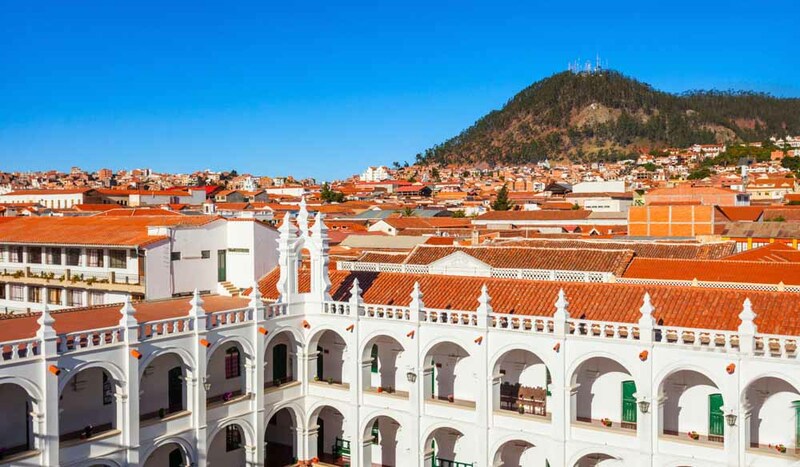 Sucre is Bolivia’s first capital city and its symbolic heart. Although La Paz has been its administrative capital since 1899 (holding the seat of government and treasury), Sucre retains its capital status according to the constitution and in the eyes of its proud citizens. 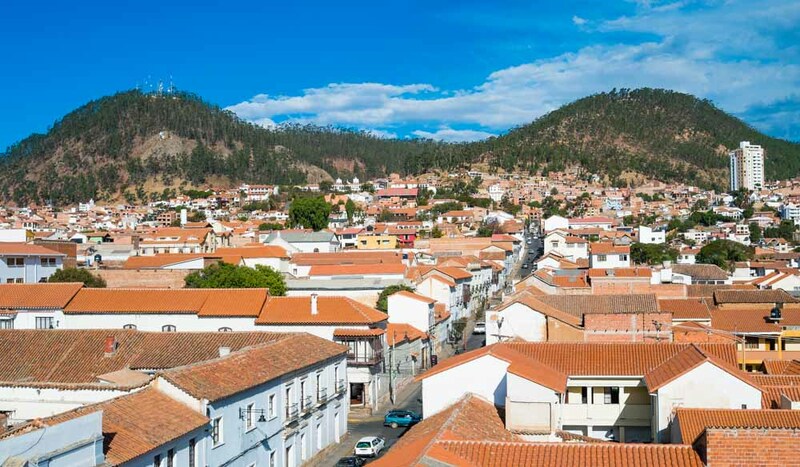 Sucre has a moderate (for Bolivia) altitude of 2790 metres, which makes it a good stopover for those wanting to ease into high-altitude living and fend off soroche (as Bolivians call altitude sickness). 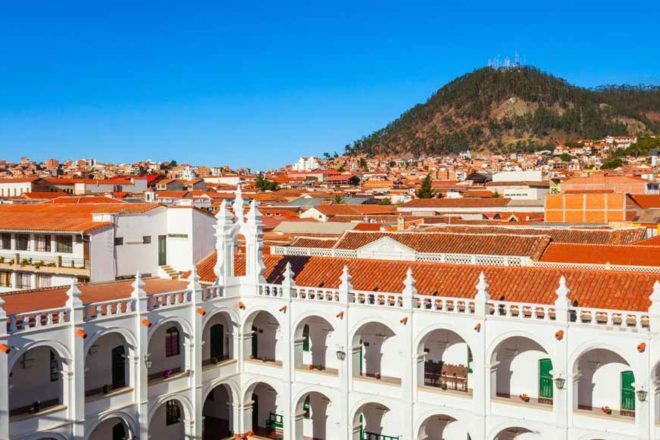 It means you can navigate Sucre’s elegant, narrow streets with ease, taking in the white-washed buildings that earned the city its nickname La Ciudad Blanca, ‘The White City’; and the wealth of religious buildings that date to the 16th century. In 1991, the city was declared a World Heritage Site. Most stops on your itinerary will be within a five-kilometre radius of the main square, 25 de Mayo. You’ll find tribes of digital nomads in sucre’s cafes: the wi-fi’s good for bolivia. If you’re in the market for some Bolivian textiles, you’ll find a colourful and high quality selection at the Sucre store of not-for-profit organisation Inca Pallay, which seeks to improve lives of indigenous weavers in some of Bolivia’s poorest communities. With its long history of chocolate production, Sucre lays claim to yet another moniker: the ‘chocolate capital of Bolivia’. You’ll find the best at Taboada and Para Ti, which uses local ingredients such as quinoa, coffee and chilli. Sucre was founded by the Spanish in 1538 as Ciudad de la Plata de la Nueva Toledo (Silver Town of New Toledo), on the lands of the Yampara people. In 1825, the region became the Republic of Bolivia and it was at the Casa de la Libertad (House of Freedom), in Sucre’s main square, that the declaration of independence was signed. Today, the building – originally a chapel constructed in 1621 as part of the Convent of the Jesuits – exists as a museum dedicated to this period in Bolivia’s history and provides a fascinating insight. Sucre’s cafe scene is ever-expanding: try Abis Cafe, Metro Cafe and Cosmo Cafe on the Plaza 25 de Mayo for a decent cup of joe. Casa Verde B&B is a homey stay with clean, comfortable rooms plus a pool. Mi Pueblo Samary Hotel Boutique, has sleek rooms that open out to patios overlooking a lovely central courtyard. A five-star hotel, Parador Santa María La Real is set in an 18th-century colonial mansion just one block from 25 de Mayo square.